Once you have given birth, you may find that you suffer from sensitive breasts. If this is the case you will really like this Anita 5075 breastfeeding bra. The fact that it has soft cups which are seamless makes it really comfortable. The cups themselves are moulded which will help to give you better support as well as give you a flattering look. Would you like a bra ideal for wearing under t-shirts? Then choose this nursing bra. How about the back of this bra? 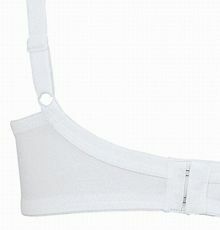 It has a stretch to it and you are looking for a bit of flexibility then you will appreciate the 3 position fastening. The edging and the straps of the 5075 nursing bra are made of fleeced stretch microfibre and the straps are also adjustable helping you get the perfect fit. It is really easy to open and close with just one hand so you won't be fumbling around! So why choose this bra? Well, if you want a great shape and are worried about sensitive breasts, then we recommend this bra. It is also Anita's lowest price nursing bra!